As the saying goes, a simple picture can evoke instant recognition of complex feelings and emotions. There’s a definite power in imagery. 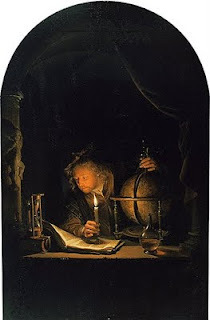 For me, that realization was reinforced the first time I saw what has become my favorite painting of all time, “Astronomer by Candlelight,” a masterpiece oil on panel work by Dutch painter Gerrit Dou circa late 1650s. With very modest dimensions of 12 5/8 by 8 3/8 in., the painting is a powerful depiction of unadulterated devotion to science. The medieval astronomer works late into the night with his rudimentary tools and methods. But it is the allure of scientific discovery and mastery of the unknown secrets of nature that fuels his inquiry about the cosmos. This simple piece has provided me hours of reflection about the purity of scientific inquiry. Luckily, the painting’s home is the Getty Center in my hometown of Los Angeles. I make semi-regular treks up to the mountain top art museum to sit in front of the painting, mesmerized by its commanding message. I even by buy stacks of special bookmarks sold at the Getty Center store with the painting on the front. This way I can mark my progress through various math and physics texts with an image that epitomizes progress in the scientific realm. Gazing upon the astronomer’s diligence is in a sense a voyeuristic exercise in trying to crawl into his head as he measures the distance between two points on a celestial globe. He holds the only source of light, a candle illuminating his face, the manuscript containing an astronomical treatise, the hourglass, the beaker of water, and the precious globe. I also equate the painting with late-night research. As a night owl, I do most of my hard-core research during the peaceful and contemplative silence of the late evening hours. The painting romanticizes this notion that the best science is done amongst the silhouettes and swirling shadows of a creative mind.